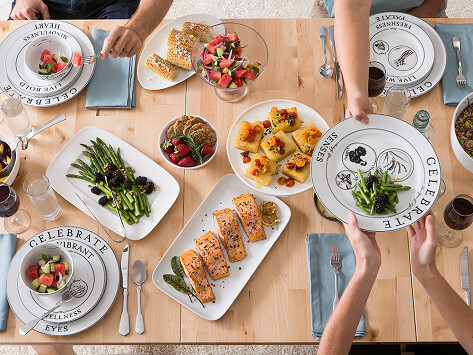 Celebrate Livliga plates feature patterns that are clever portion guides for each food group. The dishes even provide inspiring and motivational words and phrases to positively influence people as they eat. And the wide outer rim frames your meal to look like there’s plenty of food on the plate, so your eyes, brain, and stomach are satisfied. Dimensions: 13.13" x 11.13" x 8.5"
Livliga dinnerware is like a template for healthy eating—a simple, practical way to control portions and still feel satisfied. Founder Sheila Kemper Dietrich’s family had struggled with their weight for years. As the former executive director of Denver’s American Heart Association, she knew how important it was to stop super-sizing and start right-sizing their meals. Sheila designed portion control plates to guide them. The plates are smaller than the average dinnerware sold today (which has gotten bigger and bigger over the decades). 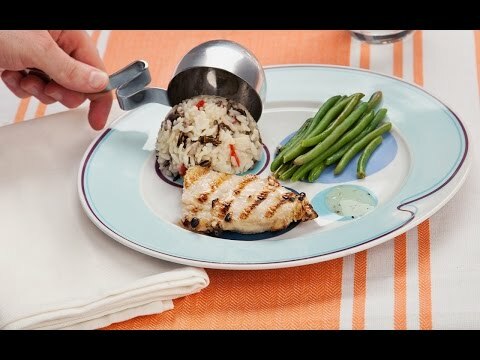 The dinnerware patterns are actually shapes that show the right portion sizes for each food group—like grains, proteins, and veggies. And the wide rim frames the food to make it look like your plate is full. Your eye, your brain, and your stomach are satisfied you’re getting enough to eat. Sheila also designed stainless steel portion-control serving spoons. The long handles keep food off your hands while serving up the right amount of food for Livliga’s plates. And when you’re done dishing up, the handles have clever zigzags that rest on the serving bowl. Sheila’s first test subjects for Livliga? Herself, her husband, and their daughter. Together they lost over 100 lbs., just by eating proper portions.